This is a fabulous handmade bag for your knitting, crochet, craft project or just general use. It easily holds two skeins of yarn with room to spare. This will stand up on it's own or the top can be folded down if desired. 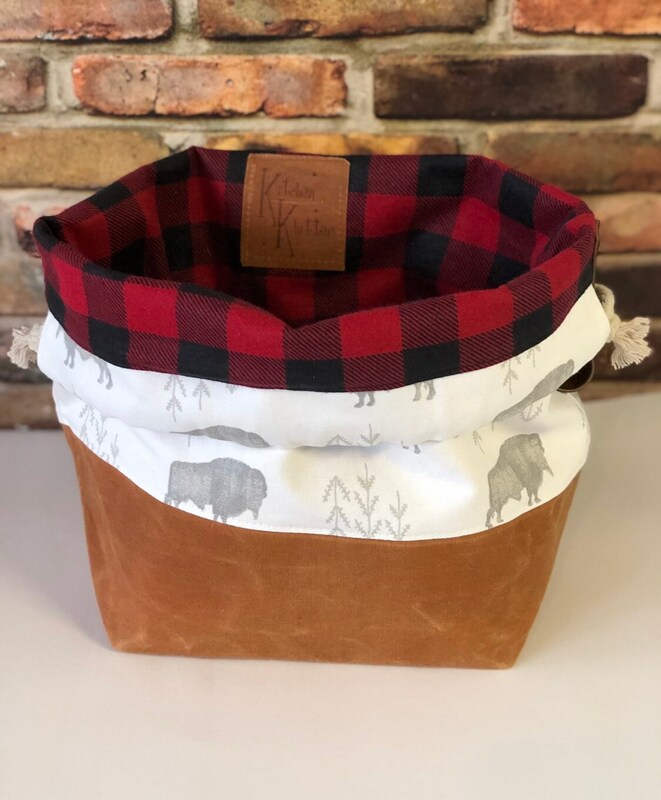 It has a base of durable Waxed Canvas, Printed Duck Canvas upper and 100% printed cotton flannel interior, a leather finger loop that is attached with a metal rivet and hand stamped with my shop initials and a cotton drawstring cord. This is a good size bag that measures approximately 15" wide x 13” tall and is 9" x 6" on the bottom. This does not have any pockets in it. The waxed canvas is naturally water and stain resistant. Lines and creases are normal and add to the character. Over time and with use the fabric will break in like an old pair of jeans and look even better! Waxed canvas is not washable but the flannel can be spot cleaned as needed. 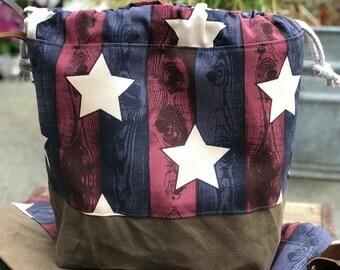 Check out my Project Bags section for more options. If you don't see what you want just request a custom order!